Waiheke has been named the best Island in Australasia & the Pacific for the second year in a row. Clearly whoever judges this is not into Bass Music Festivals, as it didn't have one... until now. 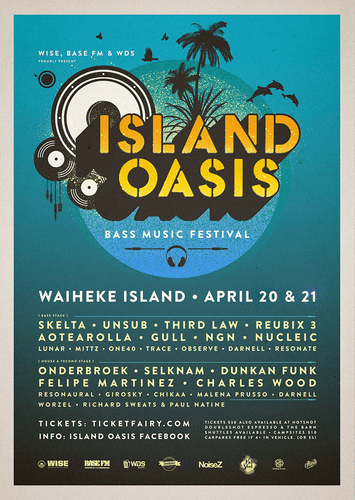 Yes this gem just 35 minutes from Auckland's downtown finally has found a way to truly showcase Island Hospitality for our fellow Bassheads. Yes Yes, Waiheke Island Style Events, Base FM & Waiheke Document & Security proudly present "Island Oasis". With Ferry & Island Transfer packages available, and over 24 hours of music over three zones, DnB, Jungle, and House & Techno stage Directed by Insomniak Records. This is the smorgasbord of deliciousness that all of you onto-it audio enthusiasts have been waiting for. Set in a lush valley, with plenty of room for camping, on-site catering, free water, art installations and roving entertainers a plenty, there are plenty of reasons to escape the dripping sweaty clubs of the city, and get yourself in front of a fat stack in the bush. Settle in for the weekend. Also for transport from Auckland. Artist links. Check the mixes, get 'em in your earhole... get hyped!